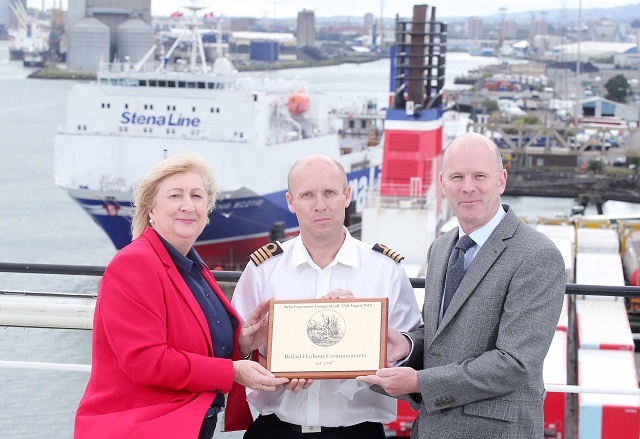 Stena Line has added the Forerunner to the Belfast to Liverpoool route. The 3,000 lane metre Stena Forerunner has been introduced as a result to growing market demand and the need for increased capacity and will increase weekly freight capacity on the service by almost 10 per cent. 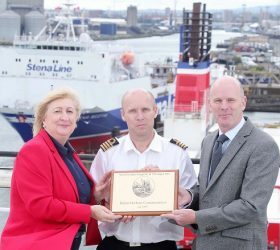 Stena Line Freight Commercial Manager (Irish Sea North) Anna Breen, Captain Marcel Schaar, Stena Line and Belfast Harbour CEO Joe O’Neill. Stena Line is currently the largest ferry operator on the Irish Sea, offering the biggest fleet and the widest choice of routes between Ireland and Britain including Belfast to Liverpool and Heysham, Belfast to Cairnryan, Dublin to Holyhead and Rosslare to Fishguard routes, with a total of 232 weekly sailing options between Ireland and Britain. Stena Line also offers a direct service from Rosslare to Cherbourg with three return crossings a week.